BETWEEN FANCY DRESS parties, fireworks displays, and spooky-themed events, Halloween is often considered a fun time of year, particularly for children. But pet owners also know how much of a scary time it can be for animals, with cats and dogs stressed by unusual noises, unfamiliar visitors and loud bangs. There are many extra risks for pets this time of year, and experts have stressed how important it is for owners to be aware of what these are and how to plan around them. “You won’t always make your pet not feel scared, but it’s more about doing everything you can to make sure they’re alright,” says Emma O’Hare of PetConnection.ie. O’Hare says the most important thing that owners can do is keep their pets indoors, away from loud noises and unfamiliar visitors. Even if pets are normally kept outdoors, she says they should be kept in a shed or garage. Once inside, owners are advised to create a safe space or ‘hiding place’ for their pets, somewhere quiet and comfortable that’s away from windows and doors with food, water and a comfortable bed or blanket. Turning on the television, closing curtains, and giving pets something to chew on will also help to distract them and reduce their anxiety. O’Hare advises owners to acquaint their pets used with these ‘safe spaces’ at least a week before Halloween, in order to help them get used to the change in their routine. “People can also help get their pets get used to noises so they become less startled on the night,” she says. Trick-or-treaters also present a unique range of problems that owners may not be aware of. O’Hare says that she hears reports every year of dogs biting visiting children, because they might feel threatened by unfamiliar callers with scary-looking masks on. To prevent such an occurrence, she advises pet owners to install a baby gate or to keep dogs securely in another room before opening the front door. On top of this, seemingly innocuous treats given out to trick-or treaters can also be problematic. Small sweets and peanuts are a choking hazard, while chocolate can also be toxic to animals in certain doses. As well as keeping these sweets away from pets, owners are advised to have the number of their local vet handy, so that if they suspect their pet is in trouble, they can get them medical assistance as soon as possible. Meanwhile, owners can also take a number of measures to help them be reunited with their pet if the worst happens and they escape on the night. “Making sure your pet is microchipped is also very important and that way if your pet does get lost, they can be scanned and returned home to you safely,” says Una O’Toole, of The Irish Blue Cross. Owners are urged to ensure that their pets are wearing a good collar with an ID tag with their contact information on Halloween night, as well as having their microchip details up to date. The Irish Blue Cross also says that excessive panting or yawning is an indicator that dogs are stressed, and has advised owners to watch out for these signs. Like O’Hare, O’Toole stresses that now is the best time to start getting pets ready. 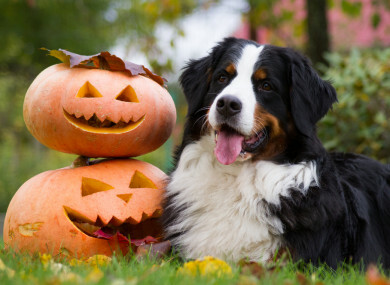 “Halloween might be a few weeks away yet but with decorations going up already, now is the time to prepare for a safe Halloween for your pet,” she said. Email “Worried about your pet being frightened this Halloween? Experts advise on how to keep them calm”. Feedback on “Worried about your pet being frightened this Halloween? Experts advise on how to keep them calm”.